Hanna is the biggest manufacturer of meters in the world and this is one of their best selling products - a genuine classic. 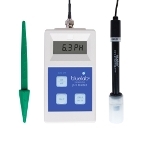 There are cheaper meters for sure but for accuracy and reliability it is hard to go past the Hanna product. Highly recommended.